An Orbital ATK Cygnus spacecraft reached the International Space Station Tuesday to unload 7,400 pounds of cargo, supplies and scientific experiments. The OA-8 cargo delivery vehicle, nicknamed S.S. Gene Cernan, is the eighth spacecraft to deliver cargo to ISS as part of Orbital ATK’s Commercial Resupply Services contract with NASA, the company said Tuesday. The spacecraft was launched Sunday aboard an Orbital ATK-built Antares rocket at the Wallops Flight Facility in Virginia. Astronauts aboard ISS used a robotic arm to capture S.S. Gene Cernan then installed the space vehicle to the station at 7:15 a.m. Eastern time. 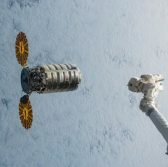 Cygnus will stay at ISS for about three weeks and will host experiments inside the cargo module as an extension of the space station, Orbital ATK noted. The spacecraft will depart ISS to a launch 14 Cubesats into orbit using a NanoRacks deployer before conducting a destructive reentry into Earth’s atmosphere. Orbital ATK is under the CRS-1 contract with NASA to send approximately 66,000 pounds of cargo to ISS. The company also received the follow-on CRS-2 contract to perform a minimum of six ISS resupply missions beginning 2019.